I posted this recipe on my old blog. I made Banana Bread tonight. This morning, Stacey and I went to the West Side Market for fresh pasta for the pasta carbonara she was going to make. The bananas, 6 pounds (2.75 Kg) for $1.00, were going to be for a dessert. 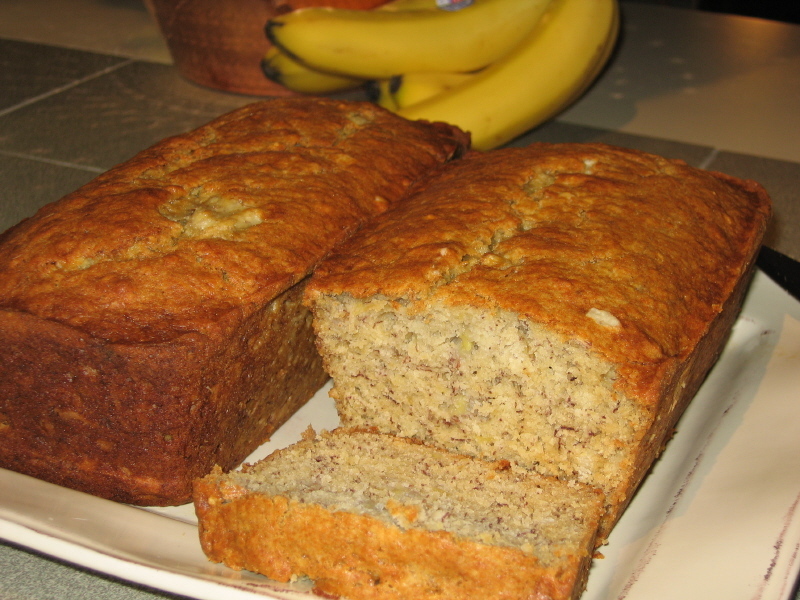 The friends we invited over punked out -- well, I guess they had a good reason, their son having been pitched though a plate glass window last week, finally at home recovering -- so, we ordered pizza and a sub from Danny Boy's; and I made two Banana Breads. This is one of the things Stacey made on our honeymoon -- err, our "honeymoon" has been touched upon briefly in other writings and is a totally separate story, but suffice to say that I didn't play baseball every night, but the team did win all the games in which I played -- and since then, it is one of my favorite things to make. I laminated the recipe card about 10 years ago because stuff gets spilled when I cook, usually my blood. Grease and flour the loaf pan. Mash 3 bananas in a mixing bowl. Stir it up with a fork, wooden spoon, or spatula. Pour into the loaf pan and bake in the oven for 1 hour or until a toothpick comes out clean. Remember that when removing the pan from the oven, it is always safer to pull the oven rack out, instead of reaching into the oven and risk burns to the inside of one of your forearms. It is best served slightly warm and when the top is crusty.